How ya doing, Amy? How was your week in 1950-something? You actually got a job? Honestly, Amy, your potty mouth is totally unnecessary! I wasn't trying to be sarcastic at all. If I were, I definitely wouldn't be sneaky about it. Of course I get that you were bored enough to apply at the diner for a job. But you can't expect the 1950s to be like the 21st century, right? Sounds to me like your choices when NOT at the diner are: reading, cooking, sewing, knitting, talking on the phone, watching television, or hanging around with other people. Don't have any friends yet? Yeah, sorry, can't help you there. How about the guy in the white shoes? Honestly, Amy, crack a smile. I was just kidding. 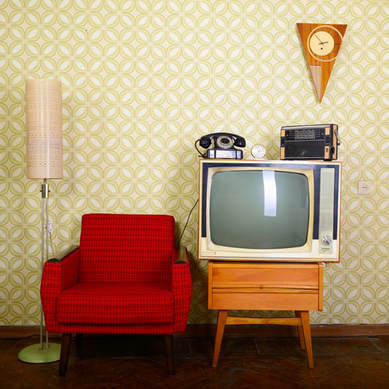 In the 1950s where you currently exist, there are approximately 10 million television sets in homes in the United States. There are three networks: ABC, CBS and NBC. The shows are broadcast live, and originate from New York. The 1950s is considered the Golden Age of Television. Variety shows, quiz shows, and comedy shows are the mainstream of entertainment, and the novelty and technology of television is adored. After the age of vaudeville and radio, families are ecstatic at seeing the faces of their favourite entertainers. Shows such as Make Room for Daddy and and Leave it to Beaver project ideal families on the screen - and this ideal is impossible for most families to achieve. In 1956, Nat King Cole is the first African-American host of a network program. His show, The Nat King Cole Show, will run for fourteen months. For the news, adults tune into Edward R. Murrow's live show coast to coast - See It Now. For children, Felix the Cat is a popular cartoon. Shows like The Howdy Doody Show and The Mickey Mouse Show are also very popular. In the 1960s and 1970s colour broadcasting will bring an important change into the history of television, but for now, it's only black and white.